The key to strengthening is a good recovery, thus sleeping is key. Ideally be in bed by 9:30 with sleeping occurring between 10 and 10:30 pm. In the winter, we can underestimate how much we need to drink so make sure to always keep fluids close by. Yes, exercise is important, but remember being active throughout your day has been shown to be as if not more beneficial to wellness. Keep the phrase in your head, You cannot exercise away sedentariness. Studies have shown prolonged sitting can have similar negative effects to your health as smoking has. As important it is to have movement, it is important to have a place of stillness. Meditation’s benefits are plentiful including immune boosting, mood enhancing, and improved memory and learning. These effects can help keep one focused on his/her wellness goals. The key to prevention is awareness of technique and posture. Set the goal that 2016 will be the year where you start to make a conscious effort to not only sit and stand straighter, but also avoid prolonged positions and move more. An ideal posture means having a little curve in your back, chest is lifted but not sticking out and ears shoulders hips and ankle aligned. When posture is ideal, then the muscles are placed in an optimal position to strengthen, lengthen and absorb shock. Keep active, focused and positive that 2016 will be AMAZING! The muscles that are important for posture are your core, upper back and hips. As with any exercise program, strengthening AND stretching are ideal. The below tips are a list of Total Gym exercises to improve posture, which in turn, will help prevent such injuries as ITB syndrome, plantar fasciitis, groin strains and lower back pain. Note: When participating in all the exercises below, engage the core first by tightening the pelvic floor, pulling the navel toward the back, and visualizing arching the lower back. Keep the core engaged and turn each exercise into a core exercise as well. While doing this exercise, focus on allowing the back and shoulders to stretch. Upon returning to upright, vary the upper body movement to emphasize strengthening various muscles of the upper back. 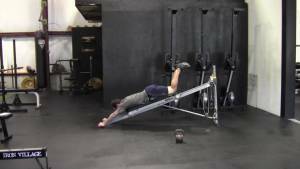 Such variations include, row, high elbow row, and reverse fly. Be careful not to lean back with pulling arms. Initiate with shoulder blades pulling down the back. Use your feet for self-spotting. Push through the entire foot and visualize pushing the knees over the toes to help avoid riding onto the neck. Keep the knees aligned with second and third toes. Allow buttocks to move backward. Keep the spine aligned, and avoid looking downward. Feet can also be on the ground or side sitting. Initiate with the shoulder blades pulling away from the shoulders. Lie down and allow leg to drop over the side. An alternative stretch is standing facing the squat stand in a lunge position with the back leg supported on the glideboard. Keep the tailbone on the glideboard while allowing one leg to move toward you while the other drops toward the floor. Maintain the knees straight but not locked. To enhance the stretch, allow the toes to turn inward and outward. Pull the toes toward you to feel the stretch into the calf. Cross one ankle over the knee. The other knee may be bent or straight. Keep the tailbone on the glideboard. Flex the foot if there is any stress to the knee. Maintain the legs straight and allow the legs to move out to the sides. To feel a deeper stretch, bend the knees to 90 degrees. Maintain the tailbone on the glideboard. Enter into a low kneeling position facing the tower. Grab the left rail with the right hand and slowly sit back onto your heels. Feel the stretch along the side of the back. Focus the breathing into the side being stretched. Stay focused and dedicated to posture and movement, and your body will return the favor by avoiding injury.